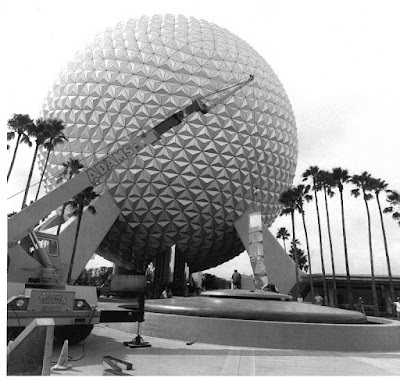 Construction photos offer us glimpses into how a beloved attraction or area came to be, even if the subject matter has long since departed Walt Disney World. Even today, as new lands and attractions spring up we crane our necks and cameras along and over walls or search out the last flyover video to catch just a hint that we can dream about until their grand debut. These moments are grand and can be epic in scale. And yet, sometimes it is the smallest of details that linger and leave their mark on us for years. Case in point, the fountain in front Spaceship Earth. The fountain today has kept the base generally the same, with smooth tiles replaced by asymmetrical stonework. Missing, however, are the three prisms that used to spring up from the center of the fountain. The three, clear Lucite statues featured the EPCOT Center logo at each of their tops and welcomed guests from 1982 until the 1990s. Depending on the time of day, the prisms would reflect light, natural and lighting effects, and the water causing some wonderful effects. Time was not kind to the monoliths, as they aged they would gain a yellowish tint, and when the motif of Future World changed just before the turn of the century they were officially retired. One of the perspectives I haven’t often seen of these original, beautiful ornamentations is their installation. In this photograph you can see the first pillar being fitted atop the fountain. It’s not a monumental moment in Walt Disney World history, but it is a great moment for those who remember, and cherish, the originality of EPCOT Center.